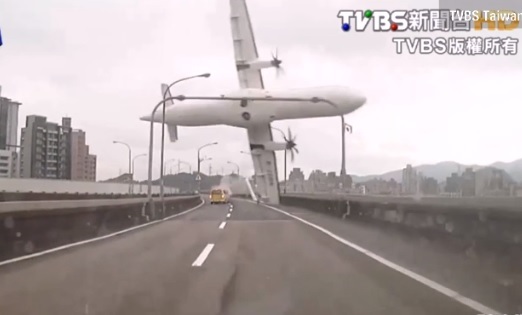 TAIPEI (Taiwan News) – At least 25 people were reported dead and 18 were missing after a TransAsia Airways flight from Taipei to Kinmen hit an elevated road and then plunged into the Keelung River in Taipei Wednesday. The plane, an ATR-72-600 barely one year old, took off from Taipei Songshan Airport at 10:53 a.m. with 53 passengers and five crew members on board but crashed just ten minutes later. Passengers included two children and two groups totaling 31 Chinese tourists on their way home to Xiamen in Fujian Province. Rescue efforts to find survivors in the wreckage on the river in Taipei’s Nangang District continued into the evening. Frogmen dived into the water to seek survivors, while an unknown number of people were still believed to be trapped inside the fuselage. The black boxes were recovered from the tail of the plane around 4 p.m., reports said. The injured people rescued from the wreckage were divided over eight hospitals. The death toll climbed gradually over the afternoon from nine to 25 in the evening. A total of 15 survivors, including three Chinese citizens, were being treated for injuries and 18 were still missing around 9:30 p.m., reports said. Cable stations played footage of the plane flying low over the elevated highway, its right wing up in the air and its left wing smashing into the road and hitting a taxi. The driver and a female passenger were taken to hospital, but they were not severely injured, reports said. The road was closed off to all traffic for a while. Work to pull the fuselage out of the water started just before 9 p.m. in the hope of finding those still unaccounted for. As evening fell, the darkness and falling temperatures hampered the rescue effort, reports said. Some structures were torn down to allow heavier equipment to move closer to the site. When the fuselage had been lying in the water, only two divers at a time could reportedly venture inside, and their expectations about the chance of finding people alive were reportedly grim. During the afternoon, an injured person was reportedly found at the Dajia Riverside Park, while six of those rescued were picked out of the river downstream from the site of the accident. A three-year-old boy had been found alive, but the other infant on the flight was still missing. Water department employees set up a barrier to catch any more passengers floating away, reports said. The plane sat on the river with its nose stuck in the mud, about 69 meters from the nearest bank, close to Jingmao Second Road in Nangang and the Nanyang Bridge in Xizhi, New Taipei City. Rescue workers aided by the military set up a floating bridge from the river bank to the wreckage and a work platform. A total of 1,000 police, military and fire service staff were involved in the operation to find survivors. According to media reports, the pilot of flight GE-235 had called in “Mayday” within two minutes of takeoff and mentioned engine trouble. The aircraft was only 5 kilometers away from the airport at the time. Eyewitnesses said the pilot tried to pull up the plane after hitting the bridge but failed. According to a map released by the authorities, the flight should have turned south immediately after taking off from the airport and then west, but instead, it continued almost straight east, crossing the Keelung River several times. The aircraft was a newer version of the same plane which crashed after an aborted landing in Penghu last July 23, killing 49 people. The Civil Aeronautics Administration said the aircraft involved in Wednesday’s disaster had just completed a safety review on January 26. The pilot, Liao Chien-tsung, had 4,914 hours on his record and his co-pilot Liu Tzu-chung 6,922 hours, the authorities said. The CAA ordered TransAsia’s 11 remaining aircraft of the same type to be grounded Wednesday until checkups had been completed, reports said. The airline’s management came out to bow for 40 seconds as an apology for the crash, but they were unable to provide any more details about the cause of the accident. 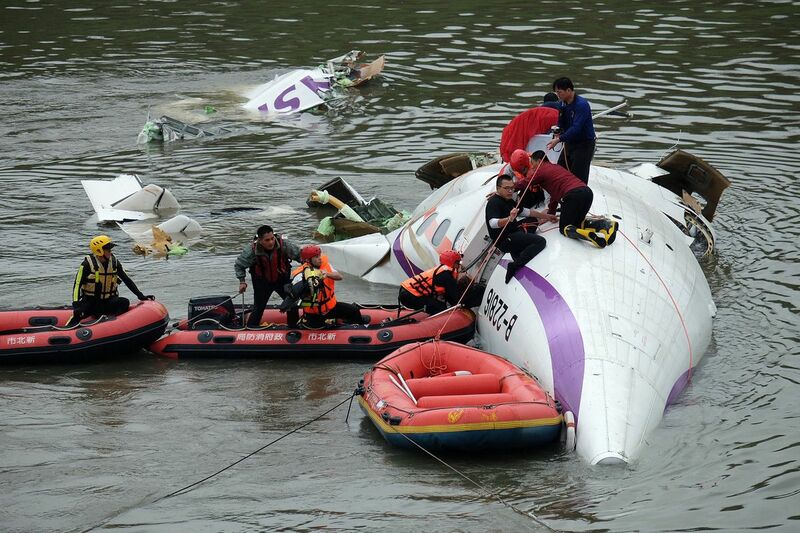 Media listed eight incidents involving TransAsia-operated ATR-72 aircraft over the past 13 years, though not all of them resulted in fatalities. Central and local governments set up emergency rescue centers, with Taipei City Mayor Ko Wen-je and New Taipei City Mayor Eric Liluan Chu leading the operations. The military joined in the rescue effort, while prosecutors visited the scene to collect evidence. The disaster had also political repercussions. The Democratic Progressive Party canceled major events in the campaign for Saturday’s legislative by-elections, why the Presidential Office and the Executive Yuan scrapped their year-end personnel parties. The accident was expected to revive the debate about the future of Taipei Songshan Airport. Closing it down and moving the flights to Taiwan Taoyuan International Airport has been a demand from some politicians since 2002, but the airport has recently seen an increase in flights, in particular to China, Japan and other nearby Asian destinations.